The first day of fall is a mere two days away, and I'm so ready for a new season of produce to play with. I love the simplicity of this fall inspired weeknight meal that I truly threw together with what we had on hand, and perfect for vegans and carnivores alike. Now that we've moved into our house, and have a functioning kitchen (ahhhh!!!) I'm trying desperately to get us back to our weeknight meal routine, which was working swimmingly before we moved 6 months ago. Meatless meals, and overall mindfulness about how much meat we are actually consuming as a household has been a huge focus for us lately. It's all about balance, which is a constant conversation between us of what we're comfortable with in terms of quantity and quality of meat. 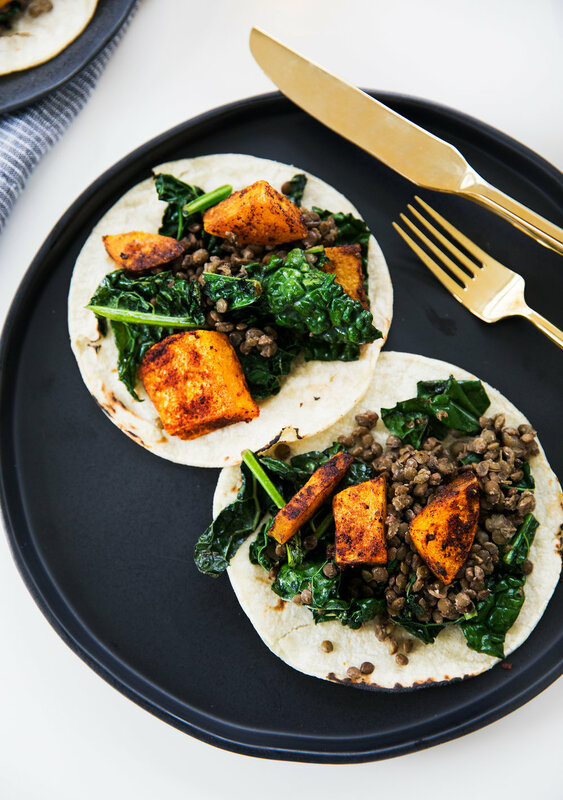 If you're on that same meatless kick, like so many of us are, then these no fuss tacos such a great solution to all your veg-focused cravings. We incorporate lentils into a lot of meals, and now that fall is nearly here, it's nice to mix it up with some delicious roasted butternut squash. If you love lentils as much as I do, cook a batch ahead of time and incorporate them as needed here. If you're looking for another way to use them up, another weeknight standby of ours is this Lentil Herb + Halloumi Salad. Still a favorite two years later! Set cooked lentils aside in a large bowl and season lightly with salt and pepper. Toss the cut butternut squash in a large mixing bowl with 2 tbsp olive oil, cumin, ancho chile powder, garlic powder, and salt and pepper to taste. Spread evenly on a large baking sheet and bake for 25-30 minutes, until browned and tender. Set aside to cool. Over medium heat in a pan prepared with olive oil, sauteé the shallot until translucent and browned a bit. Add the tuscan kale to the pan with shallot, drizzling a bit of olive oil over top, and sauté until slightly wilted. It's okay to leave it with a bit of crunch. Set the kale aside to cool. To assemble and serve: add the cooled kale to the lentils and gently mix until well incorporated. 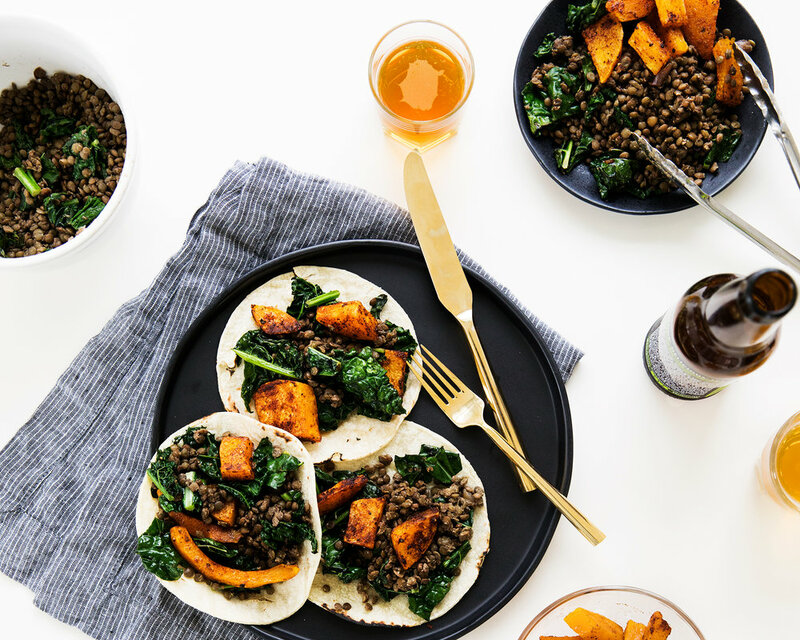 Place the lentil kale mixture in the taco shells and top with roasted butternut squash pieces.